Jordan returned with career-best figures of 5/29 and led England to a comprehensive 10-wicket win. Chris Jordan led England’s attack as they bowled out Sri Lanka for just 67 on the way to completing a crushing 10-wicket win in the third one-day international at Old Trafford. The tourists lost their last six wickets for nine runs in six overs. Sri Lanka’s total was their third lowest at this level, following the 43 they made against South Africa at Paarl in 2012 and 55 against the West Indies at Sharjah in 1986. It was also their lowest in England, with their previous worst in the country also coming at Old Trafford when, as a non-Test nation, they made 86 against eventual champions the West Indies at the inaugural World Cup in 1975. Heavy cloud cover favoured England’s attack but conditions alone could not explain how Sri Lanka were bowled out with a mammoth 26 overs remaining. James Anderson, on his Lancashire home ground, got England going with an opening burst of two wickets for no runs in five balls, with both Tillakaratne Dilshan and Lahiru Thirimanne caught behind by his county colleague Jos Buttler. Dilshan was undone by an especially good delivery which cut back into him, Buttler taking a well-judged catch. Sangakkara was caught behind off Jordan and the Sussex star then had Dinesh Chandimal taken at short extra-cover by Bell. But it was off-spinner James Tredwell who, with his first ball, took the prize wicket of Jayawardene when the right-hander was plumb lbw on the back foot. Mathews was then caught behind off Jordan, who in his 12th match at this level was well on the way to surpassing his previous best of three for 25 in England’s series-opening 81-run win against Sri Lanka at The Oval last week. The exit of Mathews was the cue for a flurry of wickets, that included a direct hit run out by Ravi Bopara. Barbados-born Jordan, 25, appropriately wrapped up proceedings when he had last man Lasith Malinga lbw for two. Brief scores: England 73/0 (Ian Bell 41 not out, Alastair Cook 30 not out) def. 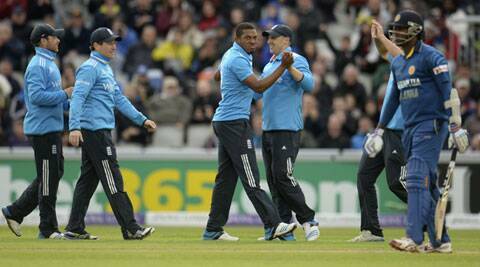 Sri Lanka 67 all out (Kumar Sangakkara 13; Chris Jordan 5-29, James Tredwell 2-2, James Anderson 2-10) by 10 wickets.